This system ensures that parliament reflects the will of the people accurately, while also ensuring a link between the people and their representative in parliament. 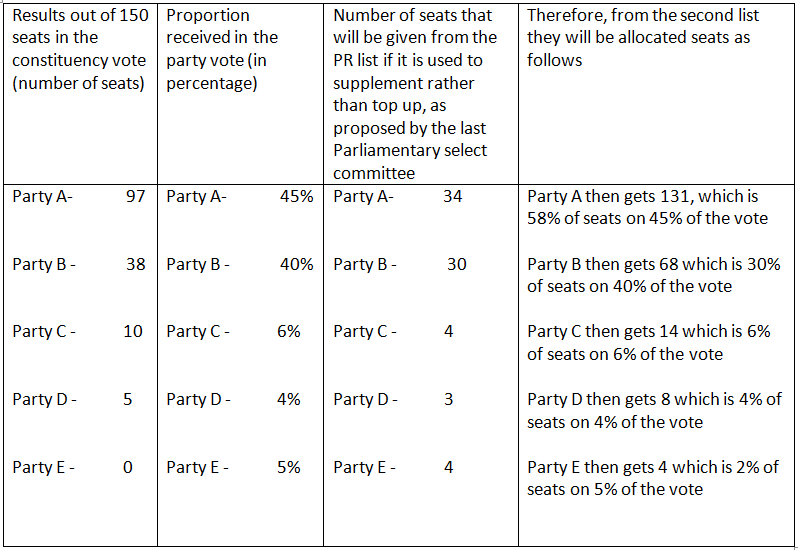 We can easily substitute Sri Lankan parties in the table above, given that the vote percentages and the seats won in terms of electorates as given here reflect the regular reality. For instance the JVP or the JHU may not win a single seat, even though they get a reasonable proportion of the vote. But it is only just that they should then be compensated at a level at which their proportion of seats in Parliament matches their vote base. And obviously democracy is strengthened if the people are represented in the proportions in which they have voted. That the currently proposed system is comparatively unfair is obvious from the table below. 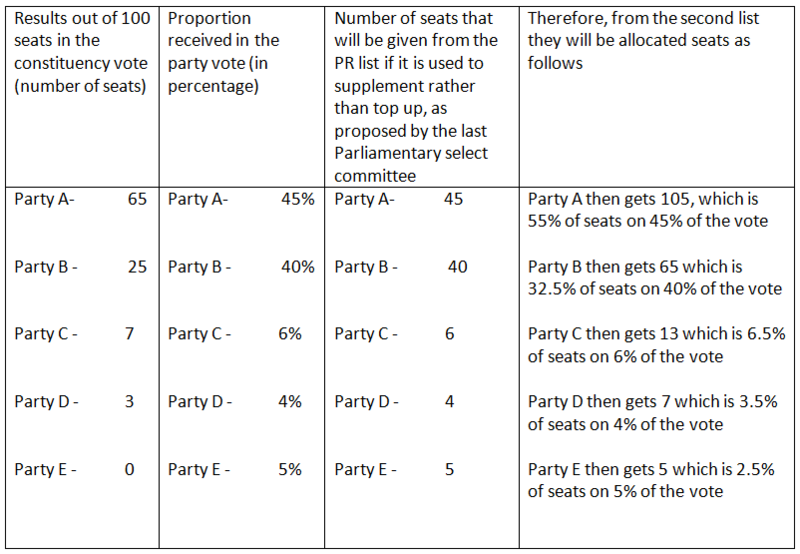 If the seats from the list are given to top up what has been won on the constituency vote, then the proportions get skewed. And generally the argument is that there should be a smaller number of seats from the list, which means that the smaller parties suffer even more of a disproportionality. It is argued that this sort of disproportionality is necessary because a fully proportional system leads to weak governments. A simple-majority system gives governments a solid majority, and a system which is weighted towards the simple majority system will be conducive to stable governments. But having a solid majority which does not reflect the will of the people often leads to abuse of power, and resentment among the people in general. On the contrary, as coalition governments in Europe have shown, a government that is sensitive to the needs of all its people tends to do a better job. As parties in a coalition accept the necessity of compromise, they tend to make adjustments and temper the rhetoric that contributes to unnecessary divisions and hostility. Of course given confrontational tendencies in Sri Lanka, and the ease with which a government might be toppled, it might make sense to introduce a list of appointees, which would be weighted towards the party forming the government. Another system to prevent continuous instability is, like in Germany, to preclude votes of No Confidence unless there is a vote of Confidence in an alternative. But in general, if there is a strict limit on the number of ministries, and more authority to opposition members in Parliament, the temptation to cross over would be less. And given the obvious unfairness of other systems, and the commitment of the current government to ensuring that ‘the total composition of Parliament would not change’, ie that full proportionality would obtain, clearly the German system would be the best option for Sri Lanka now.